Experience the magical wonderland of lights at the annual Holiday Lighting Ceremony at Westminster City Hall, complete with live holiday music, food trucks, carnival games, and of course, a visit with Santa! 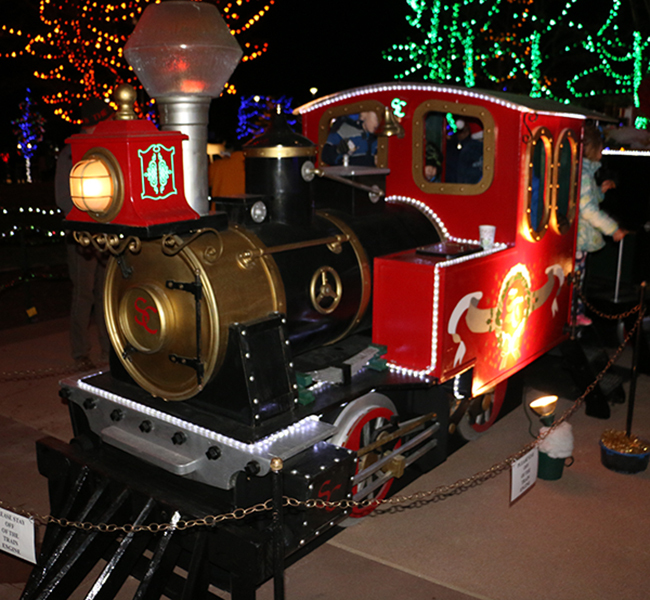 The full-size sleigh and kid-size train are perfect settings for family photos. Dress warmly—the event is mostly outside! Sponsored by NMAA/SCFD and Credit Union of Colorado. Yes! Admission is free and includes entertainment, visits with Santa, and the carnival games. You may choose to purchase items from our food vendors, such as hot cocoa, coffee, desserts, funnel cakes, tacos, or chili. Parking- There is limited parking at City Hall. Please access City Hall from 92nd Avenue (there will be no access from Yates). Overflow parking is available at Grace Community Church. Handicap Parking- Is located at City Hall and can be accessed from 92nd Avenue. Shuttling- Additional overflow parking will be at the RTD parking garage located on Yates Street between 88th and 92nd Avenue. A courtesy van will transport from the garage to the event. Santa is available from 6-8:30 p.m. (must be in line by 8:15 p.m.) to visit with children. Bring your camera or use your cell phone to snap a picture. Children can win prizes at 5 free carnival games. Thank you to Betty Adams Elementary, Crowne Point Elementary, Mad About Hoops, Westminster High School, and Westminster Dance Company for providing entertainment. The crowd size may be a little overwhelming for your pet, so it is recommended that you leave them at home. If they do join us please keep them on a leash and clean up after them. Alcohol, laser pointers, glass containers, and weapons of any type are prohibited. No marijuana use allowed in the event (public marijuana use is illegal). All bags, containers, and packages are subject to search.